Franklin, 3 vs. St. Mary’s (Lynn), 1 – Final – Franklin junior goalie Ray Ivers made 29 saves to lead the Panthers to a huge win over highly ranked St. Mary’s of Lynn, who is considered to be a top 10 team in the state by most rankings. Franklin took a 1-0 lead in the first on a goal midway through the period from Kyle Hedvig. Brendan Sicchio made it 2-0 on a redirect of Cam Cassella’s shot with under five minutes in the second period. Cassella then scored himself, blasting in a shot early in the third period to make it 3-0. Mansfield, 6 @ King Philip, 3 – Final – King Philip raced out to a 3-0 lead less than five minutes into the game but Mansfield scored six unanswered over the final 40 minutes of the game to shock the Warriors. Brendan Shandley, Conor Cooke (from Ryan Fitzpatrick), and Rocco Bianculli (from Aiden Boulger) scored each scored within a four minute span to open the game to give the Warriors a 3-0 lead. But Mansfield scored three goals in a matter of two mintues to tie the game before the end of the first period. Matty Copponi (from Brian Grant and Brad Grant), Kevin Belanger (from Brian and Brad Grant), and Chris Copponi (from Matty Copponi) scored first period goals to level the scoring. After a scoreless second, Mansfield broke the tie with just over two minutes left in the third period. Jake Lund made it 4-3 on the power play, assisted by Matty Copponi and Brad Grant. Coleman O’Brien (from Belanger) increased the lead with a goal with 1:27 left before Chris Copponi (from O’Brien) iced it with an empty net goal in the final seconds. Taunton, 6 @ Cardinal Spellman, 2 – Final – Taunton senior Jack Patneaude scored a hat trick and junior Mike Albert recorded four points as the Tigers scored a win on the road. Albert had a pair of goals and a pair of assists for Taunton while Cam Sneyd added a goal and two assists, Andrew Carter had three helpers, and Dylan Nichols finished with two assists. Andrew Gomes made 14 saves in net for the win. King Philip, 0 @ Canton, 5 – Final – After a scoreless first period, Canton senior Maggie Malloy scored two of her three goals in the second period to give the Bulldogs a lead it never relinquished. Canton scored three goals in the final period, including a goal and assist from Malloy. D1 State Dual Meet (Franklin, Mansfield) – Franklin and Mansfield each won their first matches of the day but lost in the second round. The Panthers took down Needham (55-13) and the Hornets pinned down BC High (53-18) to advance to the quarterfinals. Mansfield lost to top-seeded St. John’s Prep 42-27 and Franklin bowed out with a 30-25 setback to West Springfield. In the fifth place match, Franklin beat Mansfield (36-26) with pins from Jordan Carlucci (132), Dylan Nawn (195), and Matt Leofanti (220). Mansfield’s CJ Glaropoulos (152) had a pin in the loss to the Panthers. 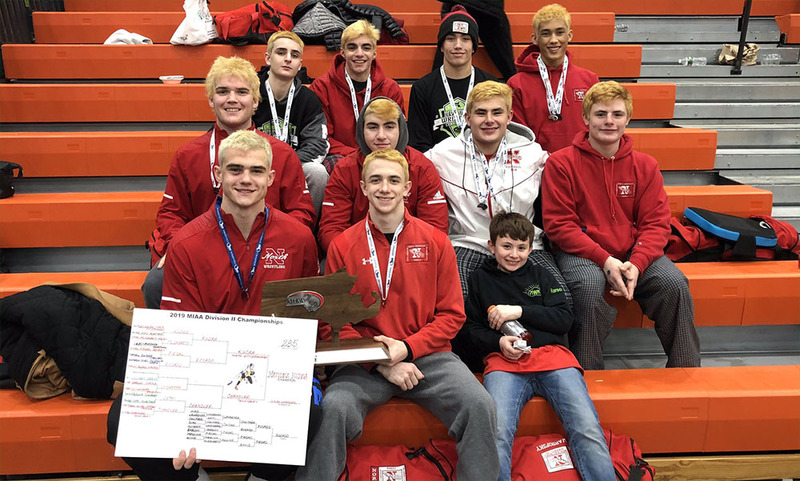 D2 State Dual Meet (North Attleboro, Oliver Ames) – Oliver Ames scored a pair of upset wins to advance to the semifinals and finished third overall, the program’s best showing at the state dual meet. The Tigers upset #11 North Andover (38-35) in the opening round and then shocked #3 Masconomet (11th in the state) with a 33-33 (tiebreaker, coach misconduct on Masco). OA’s Max Anderson (220) and Stavros Constantinous (113) had big wins to help the Tigers knock off Masco. The Tigers lost to #2 Plymouth South (45-27) in the semifinals. 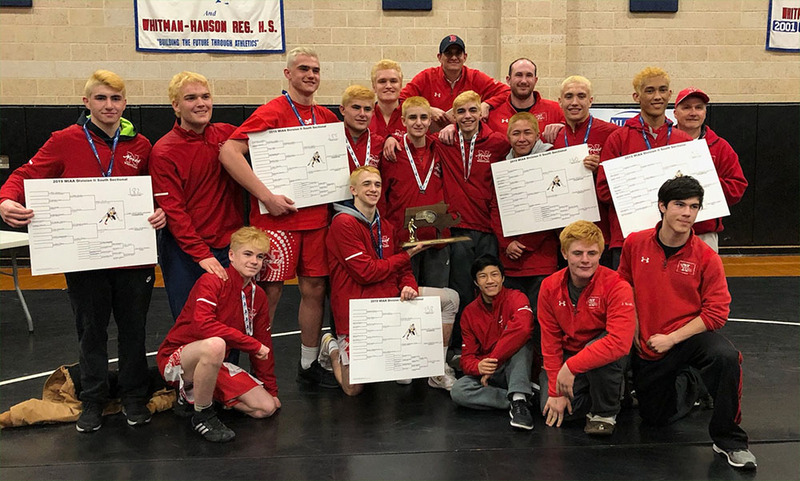 North Attleboro pinned down wins over Arlington (52-15) and Dracut (43-20) but lost to top-seeded Central Catholic in the semifinal (44-27). OA beat North Attleboro (1-0) in the consolation match. For OA, Nick McGovern, Joey Savino, and Dean Pacino each went 3-0. Canton Quad (Canton) – Canton went 1-2 on the day, opening with a win over Scituate (42-27) but dropped its second two matches, falling to New Bedford (42-18) and Hingham (43-24). Bridgewater-Raynham Super Quad (Sharon, Stoughton) – Sharon shined at the B-R super quad, going 4-0 and picking up the program’s 350th win overall. The Eagles had wins over the hosts (61-13), Silver Lake (61-16), Duxbury (54-15), and Southeastern (27-12). Max Pozner and Tyler Freedman both went 4-0 for Sharon while Tyler Chaston, Jon Wald, and Alex Bolt each posted 3-0 records for the day. Braintree Quad (Taunton) – Taunton first year wrestler James Collins (106) earned a first round pin to help the Tigers clinch a win over Nauset, giving Taunton its second win of the day. The Tigers went 1-2, losing to Braintree (52-0) but bounced back to record wins over Cambridge (33-0) and Nauset (45-34). Other winners for Taunton included Ben Mandeville (113, pin), Tyler Lima (120, pin), Wansly Perceval (126, pin), Jackson Mandeville (138, pin), Christian Balmain (152, two pins), Joseph Kazlauskas (160, pin), Jackson Wellman (182), Nico Sallaway (195, pin), and Mason Frank (285, pin). Hockomock Girls Swim Championships – Click here for a recap and photo gallery from this meet. Attleboro, 165.8 vs. Lowell, 137.7 – Final – Attleboro sophomore Andrae Butler set a new school record by scoring a 9.5 on the floor in the Bombardiers’ win. Franklin, 1 @ Canton, 3 – Final – Click here for a recap and photo gallery of this game. Mansfield, 7 @ Brockton, 1 – Final – Mansfield raced out to a 4-0 lead in the first period and added three more in the second on its way to a 7-1 victory over the Boxers. Senior Chris Copponi netted a hat trick and added an assist while Brad Grant and Coleman O’Brien each scored once and had two assists. Matt Copponi added three assists while Jake Lund and Braedon Copparini each tallied one goal apiece. Oliver Ames, 7 vs. Pembroke, 3 – Final – Oliver Ames senior Max Ward scored a hat trick to pace the Tigers to a win over visiting Pembroke. Senior Cullen Gallagher had five points, with one goal and four assists, sophomore Matt Nigro netted his first career goal, and junior Owen Connor made 19 saves in net for the win. Stoughton, 1 @ Nauset, 7 – Final – Sean Doherty scored on an assist by Luke Bainton, and Thomas McCoy played well in goal but the Black Knights suffered a setback on the road to Nauset. Taunton, 3 vs. Brookline, 4 – Final – Senior Owen Ross, senior Dylan Nichols, and freshman Loran Corcoran each scored once but the Tigers couldn’t overcome a 3-0 deficit to Brookline. Senior Andrew Carter had two assists for Taunton. Canton, 4 @ King Philip, 1 – Final – Click here for a Recap and Photo Gallery from this game. Franklin, 8 @ Bishop Stang, 5 – Final – Regan Paterson scored four times and Cassi Ronan scored a pair, as Franklin won a shootout in Fall River. Katelyn Brown and Amanda Lewandowski also scored for the Panthers. Mansfield/Oliver Ames, 7 @ Stoughton, 0 – Final – Mackenzi Fraser scored twice as the Mansfield/Oliver Ames Warriors skated to a win over Stoughton. Freshman Jess Widdop had the shutout in between the pipes for MOA. Mansfield, 33 vs. St. John’s Prep, 36 – Final – Mansfield nearly orchestrated a big comeback but couldn’t overcome an early 18-0 deficit in a close match with St. John’s Prep. Jayden Curley (182) needed just 15 seconds to earn a pinfall victory for the Hornets, and Will Stratton (145), George Glaropoulos (170), and Shane Cremmen (220) all won by fall as well. Antonios Sevastos (120), CJ Glaropoulos (152), and Ciaran Connolly (160) each by by decision. 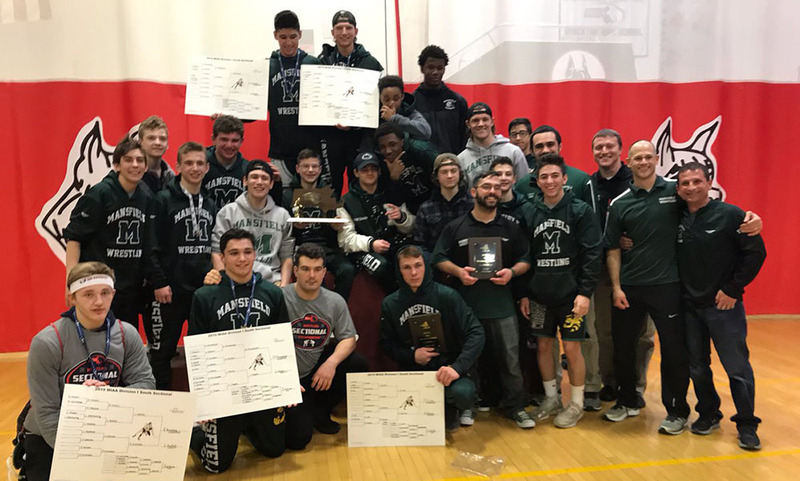 Stoughton, 24 @ Oliver Ames, 49 – Final – Oliver Ames had six grapplers win by fall and two more by decision to pick up a win over neighboring Stoughton. Remi Creighton, Joey Savino, Braeden Kelley, Billy Tat, Jeremy Clark, and Dean Pacini each won by fall while Nick McGovern and Andrew Fraser emerged victorious by decision for the Tigers. Sharon, 45 vs. Woonsocket (R.I.), 32 – Final – Sharon built a big lead early and fended off a comeback attempt from Woonsocket during the lighter weights to record the win. Sharon’s Kevin Simons (138), Tyler Cashton (152), Tyler Feedman (170), Philip Varvak (182), and Alex Bolt (195) all won by fall while Vinay Chinnam (126) and Huegens Pierre (145) won by decision for the Eagles. Taunton, 27 @ Keefe Tech, 51 – Final – Ben Mandeville (113), Xavier Sandoval (120), Jackson Mandeville (138, pin), Christian Balmain (152, 10-5 decision), and Candido Santos (160, pin) picked up wins for Taunton but the Tigers suffered a loss on the road to Keefe Tech. Attleboro, 9 @ Stoughton, 0 – Final – Attleboro senior Eddie Noel scored twice, including his first career goal while senior Jake Parker netted a hat trick in the win. Kyle McCabe added a pair of goals for Big Blue. Foxboro, 2 @ Mansfield, 4 – Final – Mansfield raced out to a 3-0 lead but had to hold off a late surge from Foxboro to earn two points. Junior Chris Copponi scored a pair of goals, including an empty net goal late in the third period to secure the win. Patrick McCafferty (from Cullin Anastasia) and Adam Anastos (from Dylan Tivnan) also scored for the Hornets. Foxboro’s Brendan Tully and Ronnie MacLellan each scored once for the Warriors. Taunton, 0 @ Franklin, 8 – Final – Taunton limited Franklin to just one goal through two periods, but the Panthers exploded for seven goals in the final 15 minutes. Joey Lizotte, Cam Trask, and Luke Downie each scored a pair of goals to lead Franklin. Canton, 1 vs. Medfield/Norton, 1 – Final – Lauren Fitzpatrick scored the lone goal for the Bulldogs, who remain unbeaten on the season. Franklin, 8 vs. Dedham, 0 – Final – Senior Jackie Connelly had a hat trick and freshman Natalie Stott recorded another shutout for the Panthers in a big non-league win. Regan Paterson chipped in with a pair of goals, while Amanda Lewandowski, Jordan Dwyer, and Victoria Quinn each scored once. King Philip, 3 vs. Medway/Ashland, 2 – Final – Nicole Connor scored a power-play goal inside the final five minutes to lift the Warriors to the victory. Meghan Gorman scored a pair of goals for KP in the win. Canton, 27 @ Sharon, 40 – Final – Sam Vilk, Will Stern, Matt Callan, and Alex Bolt each earned pins for the Eagles in the win. 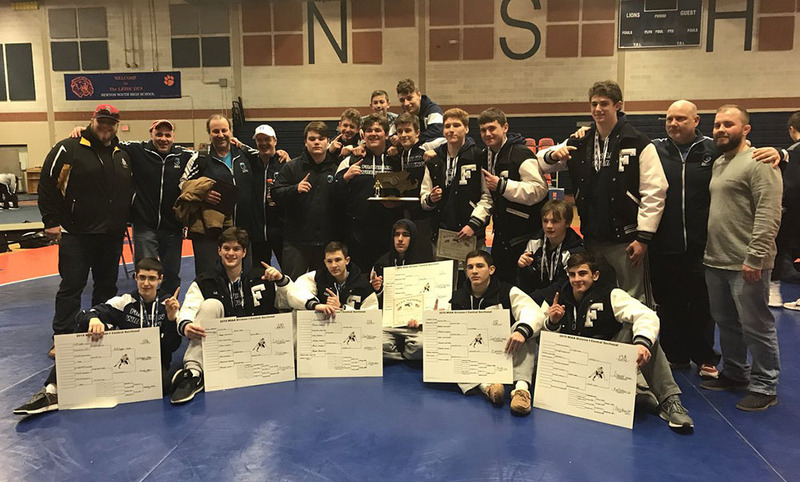 Franklin, 46 @ Oliver Ames, 12 – Final – Oliver Ames’ Anthony Berksza and Dean Pacini each earned wins for the Tigers in the loss. North Attleboro @ Milford – Postponed to Thursday, 1/18 at 7:00. Sharon @ Milford – Postponed to Thursday, 1/18 at 4:00. Sidney Treeful (KP) 35.4; Alexis Berthiaume (KP) 32.3; Kamryn Li (THS) 31.1.